Imagine spending the winter months stark naked in a damp, frozen woodland environment. It’s a chilling prospect, is it not? One that dwarfs any self-described Polar Bear Club’s seconds-long winter swim. But there is a creature, native to Long Island, which does just that. This species is no 100+ pound, hairy mass of endothermic (warm-blooded) protoplasm dressed in a Speedo, but rather, an ectothermic (cold-blooded) critter weighing in at less than a quarter ounce, that endures this wintry imprisonment unclad and unconscious. It spends the winter barely protected, perhaps under a log or burrowed beneath the leaf litter. When things warm up a bit in early spring, this small being thaws and emerges, then lets loose with a loud and lusty chorus for all to hear, heartily announcing that winter is going, going, gone and that springtime is a-coming on! It is of a tree frog that I sing, one commonly known, among us heat-bill paying humans, as the “Spring peeper” and scientifically dubbed, Pseudacris crucifer. How does such a minute, mercilessly exposed and thin-skinned animal manage to endure temperatures that cause us to wrap ourselves in endless layers, place insulated hats upon our heads and warm boots upon our feet before venturing forth from our heated homes to our heated cars? The answer, in a word, is sugar. The frog’s seasonal rise in blood sugar acts as a cryoprotectant, or anti-freeze, that prevents ice crystals from forming and damaging its cells. Over the eons, the “sweeter” frogs were naturally selected, producing a population with the ability to successfully over-winter across a wide range east of the Mississippi, from Canada down to Florida. In this over-wintering torpor their metabolism slows down dramatically; they get as close to death’s door as possible without passing through that dismal portal. This increase in blood sugar lasts only during their hibernation and resets to normal levels at frog-thawing time, preventing damage to Pseudacris. The spring peeper is not physically imposing, its length measures, snout-to-vent, from 0.75 to 1.5 inches. It has a characteristic field mark of an “X” on its back, which accounts for the species name of crucifer or “one who carries a cross.” Like all tree frogs, this hardy amphibian has small round sticky toe pads at the end of each digit, which enables it to climb shrubs and trees, although it prefers life on the ground. Their color varies across the spectrum of earth tones, but is never quite green (sorry Kermit). The peeper’s woodland palette and its ability to darken or lighten, depending upon surroundings, bestows upon Pseudacris an enhanced ability to camouflage itself. 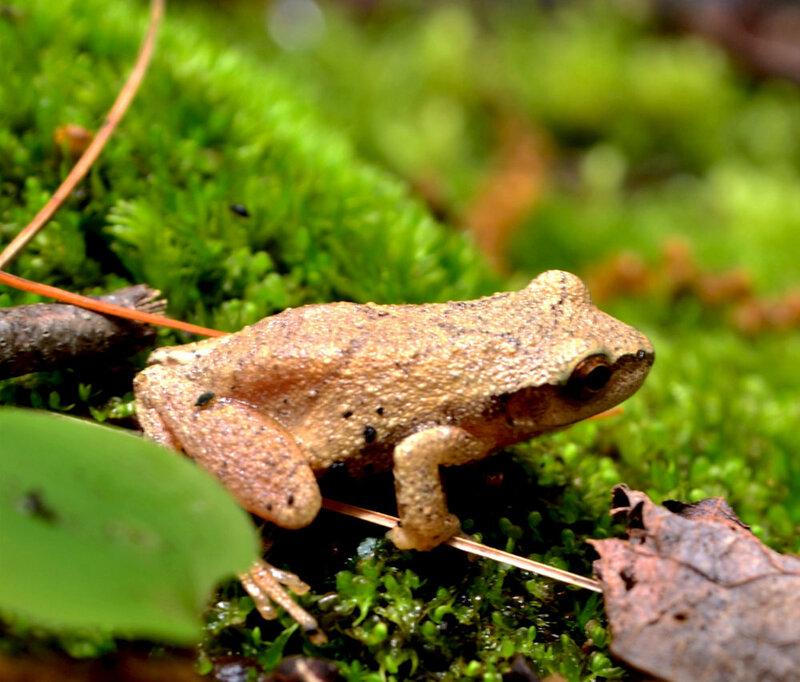 The peeper spends its 3-year existence in a variety of environments – from woodlands to marshes – that share the characteristic, mandatory among amphibians, of suitable water for breeding. Puny as this miniature amphibian might appear, it is in reality an energetic carnivore. The menu that natural selection has served up includes small spiders, daddy long-legs, ticks, pill bugs, mites and small insects such as ants, beetles, flies and caterpillars. In fact, this diminutive tree frog will eat virtually anything tiny enough to be crammed into its tiger-ish maw. Of course “eating” is only one side of the eternal eat-or-be-eaten equation of the natural (and, dare I say, “civilized”) world. That being the case, the peeper is regularly on the menu for larger frogs, fish, birds, diving beetles, snakes, spiders and parasites that find it – frog legs and all – to be a quite tasty morsel. I believe we humans refer to this uncomfortable reality as “the balance of nature.” But, it is just this balance that we humans have been mindlessly messing with for millennia. As if avoiding the “be-eaten” side of the equation wasn’t enough, we’ve stacked the deck against the peeper’s chance of success by adding such pestilential variables as acid rain, over-development of wetlands, and a variety of invidious pollutants (to which its ability to camouflage itself and strongly leap about provides no defense). The males compete in these large nocturnal groups in order to attract their female counterparts. They inflate their throats patches into semi-transparent balloons, the forceful collapse of which results in their lusty “peep” of love. So amorous are these Romeos that they can make up to 90 peeps per minute for a duration of 4 hours, which adds up to more than 21,000 love calls per frog, per night! The females are attracted to the most boisterous singers of this competition, to which American Idol cannot compare (on many levels). There is no long elaborate courtship within Peeperdom, the very moment a female touches the male of her choice it becomes a match made in heaven. He mounts her and they consummate the act of love. Each female then lays about 800 to 1,000 eggs, assiduously attaching them, either singly or in small groupings, to underwater surfaces. And then the young are on their own. The adult frogs have no interest in experiencing the joys of parenting; they retreat to more protected areas to spend the summer trying to stay moist, hunting and being hunted, until it’s time to hibernate again in the fall. The eggs hatch in 6 to 12 days, and tiny tadpoles emerge into the surrounding water. The tadpoles are a kinder, gentler form of the peeper – they are vegetarians, grazers of algae and decaying plants. During this benign stage there’s no rest from the relentless pressure of natural selection, for there are many predators lurking about in their seemingly bucolic ponds eager to snack upon their burgeoning bodies. This is the reason why each female produces 800 to 1,000 eggs! After about 100 days, the tadpoles that somehow survive the unsentimental gauntlet thrown down by evolution slowly transform into adult frogs. Their mouthparts develop jaws and teeth; their cartilaginous skeleton ossifies into bone; their fish-like tail shrinks and disappears as the front and back legs mature. Then, behold Pseudacris crucifer, as it crawls out of its small woodland pond and upon dry land, reprising that astounding moment when, approximately 360 million years ago, the first amphibian crawled out of its primeval pool and staked a claim on some ancient shoreline.